Lyssa Morris represents Fortune 500 clients in protecting their intellectual property. Ms. Morris’ practice specializes in the preparation and prosecution of U.S. patent applications, primarily in the area of the computer and software arts – including end user software, mobile/Internet technologies, consumer products, Internet of Things, and sensor devices. Prior to joining the firm, Ms. Morris worked as a technology specialist/patent agent at a New York law firm. 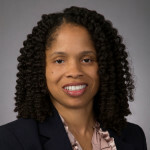 Before attending law school, Ms. Morris worked as a database developer and a business analyst at Alliance Bernstein, Cambridge Technology Partners, and Oracle Corporation. Ms. Morris earned her B.S. in computer science from Spelman College and her M.S. in computer science from Columbia University. Ms. Morris earned her J.D. from Brooklyn Law School, where she served as an associate managing editor on the Brooklyn Journal of Corporate, Financial & Commercial Law.